Computer users like to use keyboard shortcuts to perform some predefined functions. By making full use of keyboard shortcuts, it will accelerate and speed up your work and save your time substantially. Just imagine, by pressing one or more keys together, you can execute your commands immediately instead of following the sequences to a few keystrokes which is time-consuming. If you are using Microsoft’s Windows OS, Microsoft does offer you a list of keyboard shortcuts to accelerate your tasks. For instance, instead of using your mouse to point to the “Close” sign or go to Menu bar and click “Exit”, you can press “ALT+F4” simultaneously to close the current window immediately. It is fast and easy. You can find lists of keyboard shortcuts here. a. Go to Start/Program and select the application which you want to create a keyboard shortcut for. 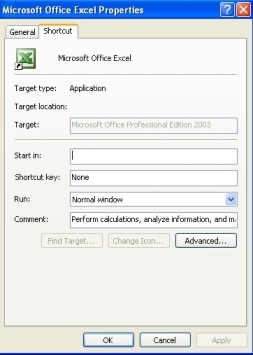 For demo purpose, we choose Microsoft Excel as an example. 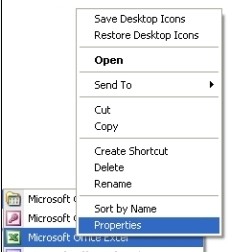 Right Click Microsoft Excel and choose Properties. c.	Find out from the Shortcut Key Box whether any keyboard shortcut is being assigned. If the box displays “None”, then you can select your shortcut key. Just move the cursor to the Shortcut Key Box and press your Shortcut Key simultaneously. 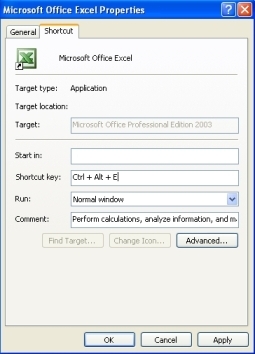 In this demo, we press Ctrl + Alt + E. Note: all shortcut keys must be used in a combination with Ctrl + Alt. d.	Click “Apply” and “OK”. It is done. So when you want to run Microsoft Excel, just press the shortcut keys together: Ctrl + Alt + E and the application will open immediately.